Setting Business Strategy DVD by Brian Tracy – Discount! Every successful business starts with an effective business strategy. Whether you call it a mission statement or business plan, your business cannot grow without following a cohesive program. 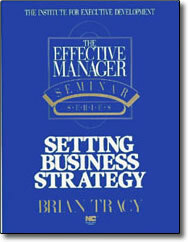 In this program, business management expert, Brian Tracy, teaches business owners and managers how to develop an effective business strategy.